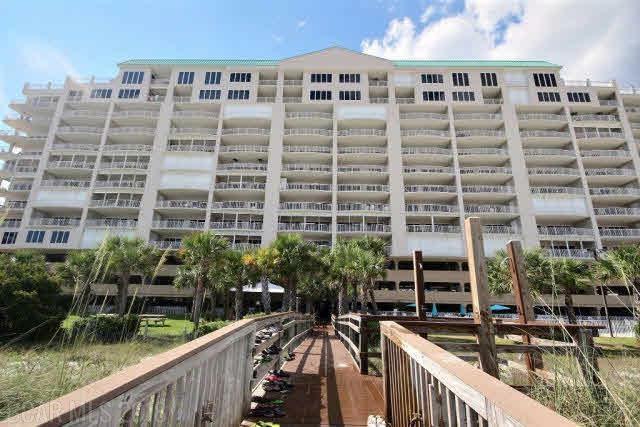 Very nice 2 bedroom/2.5 bath unit with direct Gulf of Mexico views on the 3rd floor. Has extra large balcony with electric storm shutters. Recently upgraded furniture and appliances. Heated indoor pool, sauna and steam room. Large outdoor pool and spa. Covered Gazebo with gas bar-b-q grills and spectacular beach views. Amenities include covered private parking spot, high speed elevators, on-site management, fitness room and clubhouse area. Private storage unit on the balcony within the unit. Non-rental unit which can be placed on a rental program. This would make a great investment property. Listing provided courtesy of Pleasure Island Properties. Listing information © 2019 Baldwin County Association of REALTORS® MLS.